Marinate the pork in the chilli, ginger and honey for 5 minutes. 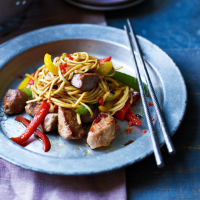 Heat the oil and stir-fry the pork until golden, then add the peppers and stir-fry for a further 2 minutes. Add the lime juice and zest, soy sauce and sesame oil; cook for 1 minute, then add the noodles and cook for 2–3 minutes until the liquid has been absorbed. Serve at once. Fresh noodles are ideal for stir-fries – just add them straight to the wok. They’re also great in Asian soups.